SUMMARY: Do you feel unfamiliar with the Bible and want a friendly introduction? Have you been reading the Bible for years but could use a fresh approach—or a flavorful jolt? Are you thinking of inviting a friend to read the Bible, who has never read it before? With each chapter a metaphor for Bible reading, Behold the Beauty gives a warm welcome to the pages of the Bible. Come on in! THE BACK STORY: I first learned to study the Bible during my undergraduate years in engineering at the California Institute of Technology, using a left-brained approach called “manuscript Bible study” that incorporates inductive Bible study methods and appeals to many students. But as I grew older and made friends away from the college environment, I found that many Christians and churchgoers actually despised the Bible study methods I had been practicing daily for years! So, influenced by my new interests as a poet, children’s fiction writer, and home educator, I developed a class for church called “Behold the Beauty: A Heart Approach to Bible Reading” (purposely avoiding the word “study”). This, along with several years’ experience as a devotional blogger, eventually came together as this book. I kept the original title of that church Bible study, Behold the Beauty, and changed the subtitle to An Invitation to Bible Reading. My friend Jean Fleming, writer and ministry leader on The Navigators staff for more than 50 years, wrote the Foreword. WHY THIS TITLE: Perhaps churchgoers have always thought of the Bible as something to study or a stagnant book for gaining head knowledge. 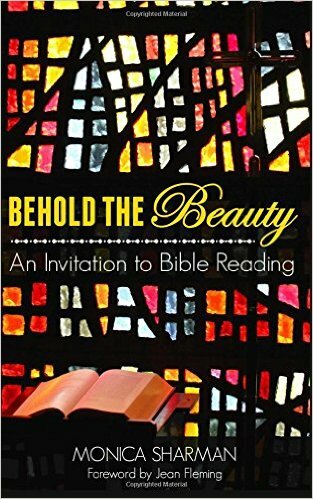 This book emphasizes reading the Bible to know God better and see His beauty and the beauty of His Word. The subtitle includes the word Invitation because it is just that: a simple invitation and intentionally not a “how to” or “you should” book. “Monica Sharman knows her bible, but more than that, she savors it. She has tasted and seen the goodness of the Holy Scriptures, and she doesn’t want any of us to miss it. That’s the heart behind this treasure of a book. Prepare to fall in love with God’s word all over again as you travel through Behold the Beauty, a book that is — at once — full of whimsy and wisdom.” — Jennifer Dukes Lee, author of Love Idol. “By way of telling her own personal stories, Monica Sharman invites us back into the Story strong enough to hold us all. It’s an invitation with purpose, that our joy might be full.” — John Blase, poet and author of Know When to Hold ‘Em: The High Stakes Game of Fatherhood. “Nonfiction with all the color and energy of story, it will pull you right in.” — Jill Case Brown, author of Safe. AUTHOR PROFILE: Monica Sharman started reading the Bible during her freshman year in college and hasn’t stopped since. She has shared her excitement over Bible reading by teaching it at home, in the neighborhood, and at church. Find out more at monicasharman.wordpress.com. Darrell, I’ve sent a message to this young woman on her FB page. We should obviously be sharing some thoughts.